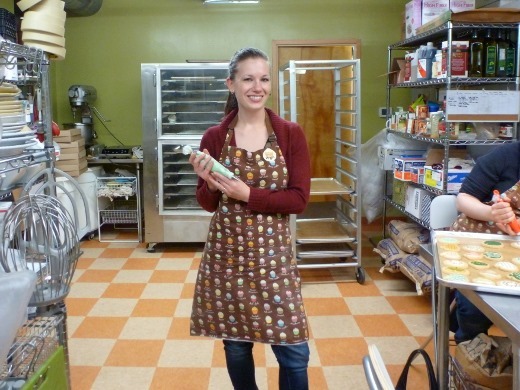 Classes are also offered by the bakery. Sign up early though! We signed up pretty far in advance – classes are quite small, which allows for individualized attention, opportunities to ask questions and to receive one-on-on help during the class. The very talented assistant designer Claudia taught our class (assisted by business manager Abby). 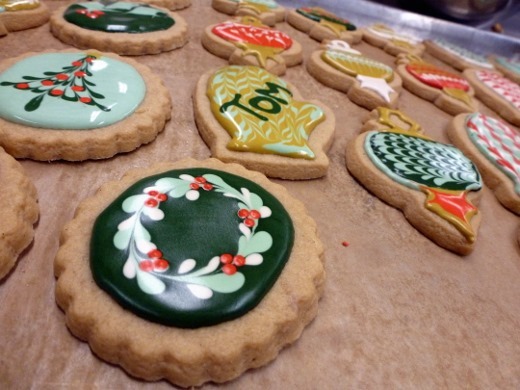 The brown sugar cookies and dyed royal icing were all ready for us when we arrived, but Claudia still shared many tips and tricks for baking the cookies, sourcing quality ingredients, and preparing the royal icing. We also received copies of the recipes for each of these two items [above]. 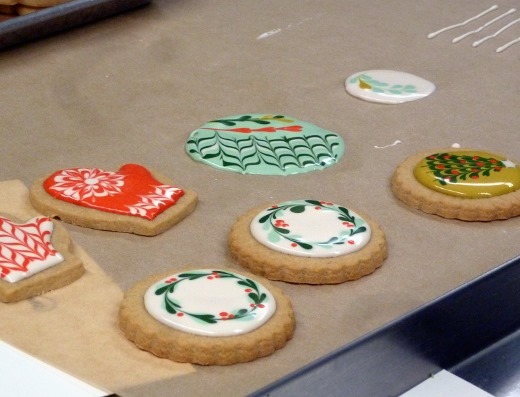 Claudia demonstrated a few techniques for decorating cookies using royal icing. I couldn’t believe these beautiful designs were simply created with a combination of lines and dots swirled with toothpicks! 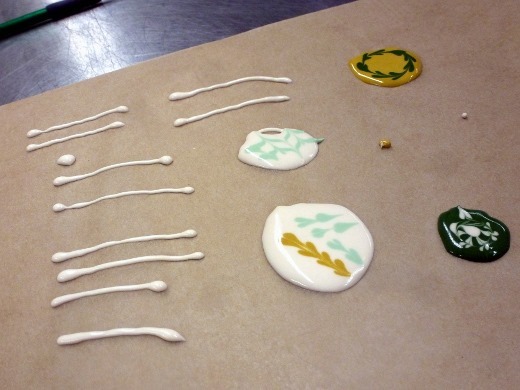 After the demonstration, we were set free to practice lines and designs on parchment paper. My lines looked more like q-tips at first, but quickly improved. 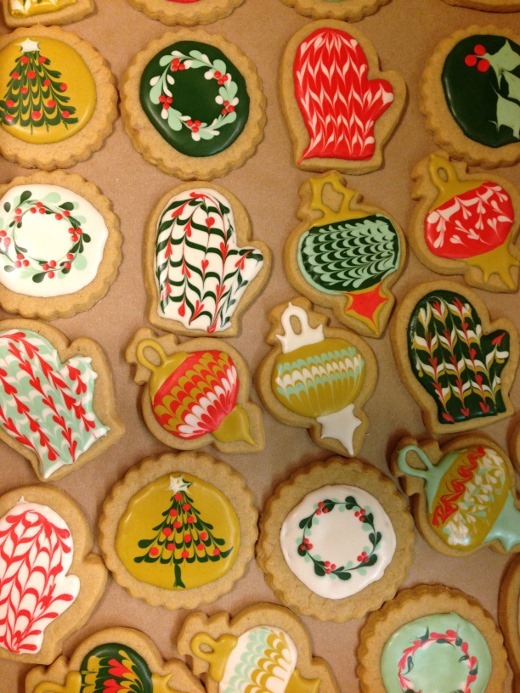 Claudia expressed her preference for sticking to a small palette of colors and designs, to create a cohesive theme throughout your cookie project. 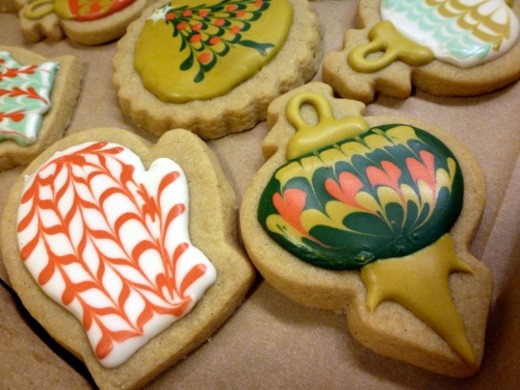 I have to agree that limiting yourself to just a few designs and colors does make for a professional-looking batch of cookies. 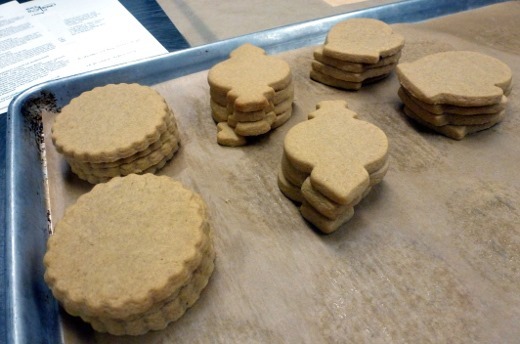 After a bit of practice, we all receive two dozen brown sugar cookies! Then the fun really began! 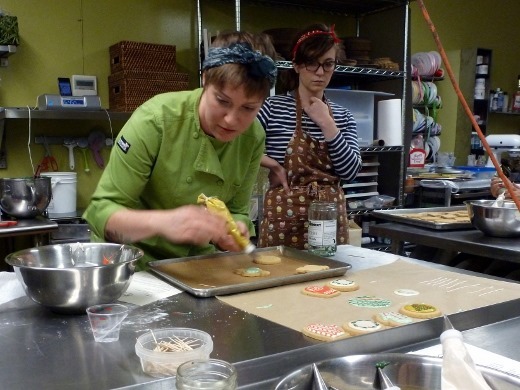 We were set free to decorate all of our cookies, and our instructor offered tips, tricks, and more demos along the way. Have I changed much since 1990!? 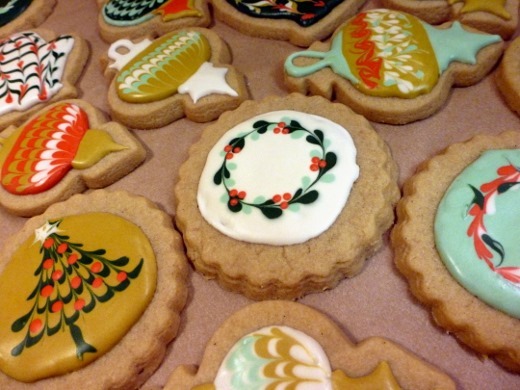 I have such fond memories from my childhood of decorating dozens and dozens of sugar cookies at my grandma and grandpa’s house with the family. 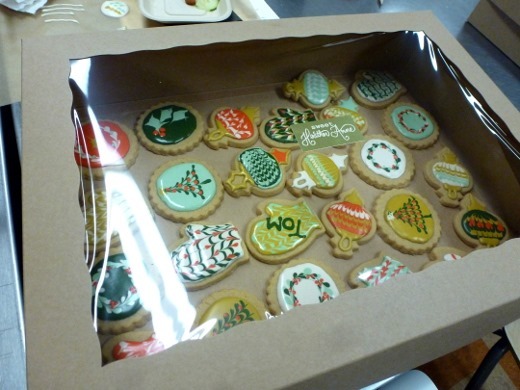 At the end of the class, our cookies with still-wet icing were beautifully placed in a single layer in these fancy boxes for easy transport home. When I arrived home I couldn’t help but admire my creations! I think my favorite designs are the wreaths. They are so simple yet pretty. Oh, and they taste good too! The addition of quality local Calder Dairy butter and vanilla bean paste in the cookies really make for a delicious cookie. 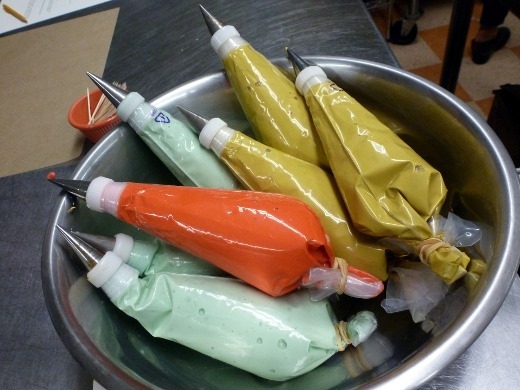 The icing also has an appealing mild maple scent and flavor which is really nice. 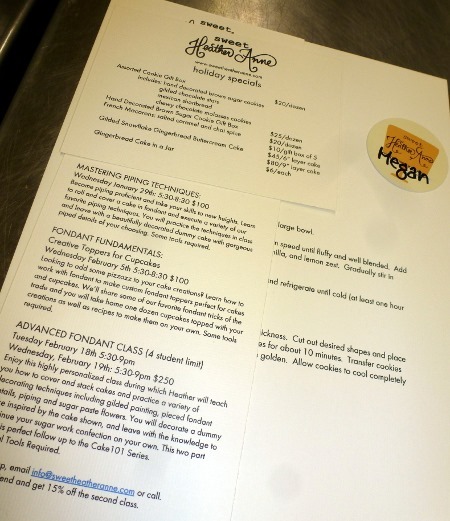 This class made for a really fun evening and I definitely recommend checking out both the baked goods and classes at Sweet Heather Anne if you have the chance. Great pics. Enjoyed this read. Megan, these are beautiful. When you changed your cover photo, I was going to ask if you decorated those! Thanks for including the picture from 1990. 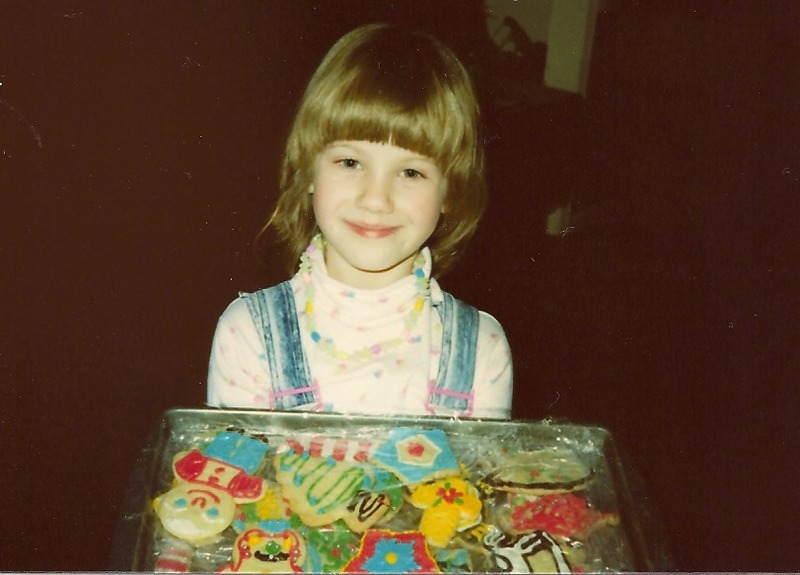 Those cookies are pretty awesome, too! Totally enjoyed this post! Pingback: Dinner Meal Plan for December 22-28 | Meg.Goes.Nom.Nom.